Auto Shutdown Manager is a Windows Service based, centrally managed and network enabled PC Power Management solution for enterprises, public sectors, educational institutions, NPOs and private users which helps to save money and to increase security. 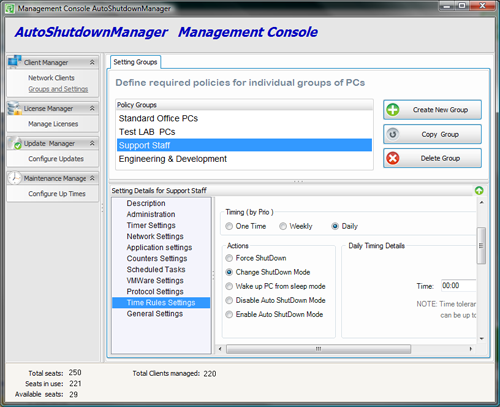 Auto Shutdown Manager allows an intelligent startup of needed and shutdown of unused computers - but unlike other solutions, it never interrupts working users or productive systems - at no time. ...... systems - at no time. Take full control of the shutdown, wake-up and sleep modes of your PCs and Servers - on demand, by time, for patch management or by policies. Automatically start up, wake up, shutdown, log off users, standby or hibernate all your PCs and servers. Qweas is providing links to Auto Shutdown Manager 4.9.7.1 as a courtesy, and makes no representations regarding Auto Shutdown Manager or any other applications or any information related thereto. Any questions, complaints or claims regarding this application Auto Shutdown Manager 4.9.7.1 must be directed to the appropriate software vendor. You may click the publisher link of Auto Shutdown Manager on the top of this page to get more details about the vendor.